Fans of Bethesda’s The Elder Scrolls V: Skyrim might be interested to learn that Prima have launched a new official Skyrim world interactive map in to the Apple iTunes Store, for iPhone, iPod touch, and iPad devices. 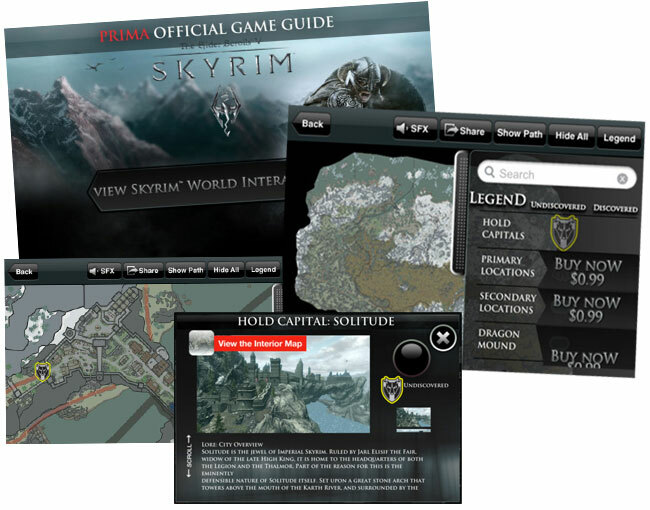 The new Skyrim map application has been designed by the original team who created Skyrim’s Prima official game guide. Revealing every primary, secondary location, vendor, trainer, skill book, point of interest, world encounter, and unique item throughout the Skyrim world. The Skyrim application includes the 9 major Hold cities to the open expanses of wilderness and mountains, together with over 150 interactive maps, to help you find your way around without any problem. You can even set your own points of interest to the map, and zoom in up to 3200%. The Skyrim Prima app is free to download and contains the all 9 hold capital city locations for free. More content can then be purchased in-app, which includes: over 160 interior maps, over 350 primary locations, 200 secondary locations and over 1,000 points of interest. The total cost for everything will set you back $10. You can download the new Elder Scrolls V: Skyrim Prima Official application from the iTunes App Store for free now. Now news as yet to whether the app will be arriving on Android devices.